Since discovering the Alexander Technique many years ago, I’ve been fascinated by the posture and movement patterns I observe in others. When I see someone who stands, sits and moves with ease – Fred Astaire is one of my favorites – I ask the same sort of questions. Early on I developed a special interest in two groups of people, both of which it seemed to me to have generally better use of themselves than the general public. The first group is politicians. It all started one evening while channel surfing on a cold winter evening in Toronto. I stumbled onto the local community access channel which was streaming a Metro Toronto City Council debate. The topic of the debate – sidewalk repairs in an outer burb – held no interest for me, but I noticed that almost all the speakers had what I would characterize as free necks and jaws when they spoke. I expanded my observation to broadcasts of the Canadian Parliament in Ottawa, The British Parliament, and speeches on the floor of the US Congress – and to politicians generally. I saw very few examples of what Alexander Technique teachers would call “poor use”. 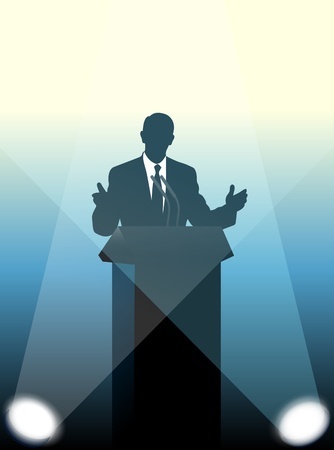 Over time I came to realize that an aspiring politician who tenses his neck and jaw while speaking is not likely to be seen as an authoritative figure, and so probably won’t be a politician for long. As I said, there are some exceptions. In my view, Jimmy Carter was one, and to a lesser extent Bill Clinton, George W. Bush and Bernie Sanders. I’m including a short video from a 1980 Regan-Carter presidential debate in which Carter’s manner of speaking contrasts strongly with Ronald Regan’s. The second group – and, no, I’m not especially proud of my fascination with this! – is American televangelists. I find myself mesmerized by their deportment, and their ability to raise millions of dollars from their audience. My all-time favorite is Jimmy Swaggart** and I’ve included an excerpt from one of his broadcasts below. It was recorded after the first of his several falls from grace – in this case stemming from his involvement with prostitutes and drugs. I only saw one televangelist (a weird-looking guy in Ohio who would start slow and then whip himself into a bizarre altered state as his sermon continued) who did not have a necks that were free, head lightly resting on his spine, and a jaw free to deliver the message. Again, I think the lesson here is that an aspiring televangelist with a tight neck is not likely to be a successful televangelist. Returning to politicians – right now, late 2015 – we in America have the opportunity to see a LOT of them! Americans’ faith in government may at an all time low – and for good reason – but we are living in a Golden Age of political theater. And a unique opportunity to use our observational skills as Alexander Technique students and teachers to observe the candidates’ posture and co-ordination, and to compare what we see and hear with what others observe. Please share your own observations below – and don’t forget to include any relevant YouTube links. *F. Matthias Alexander, the developer of the Alexander Technique would always go to the circus when it was in town because he knew he would see examples of “good use”. **Jimmy Swaggart, country singer Mickey Gilley, and rock and roll and country singer country Jerry Lee Louis were cousins who grew up together in Ferriday, Louisiana.